The MQ-9 Reaper sets the benchmark for Unmanned Aerial Vehicle (UAV) technology. It is the first hunter-killer UAV made for long endurance, high-altitude surveillance. Built by General Atomics Aeronautical Systems, the Reaper is remotely operated or piloted by the USAF from the Ground Control Station (GCS). The MQ-9’s first combat missions happened in the summer of 2007 in Iraq and Afghanistan. Because of its multi-mode communications suite, wide-range sensors, as well as precision weapons, this unmanned aircraft was able to display unparalleled capability in performing not only strikes but also coordination and reconnaissance with targets that are fleeting, high-value, and time sensitive. The Reaper further proved its capabilities by successfully performing other missions such as surveillance, intelligence, close-air support, buddy-laser, combat search and rescue, route clearance, and a whole lot more. Some MQ-9 units are still airworthy up to these days. 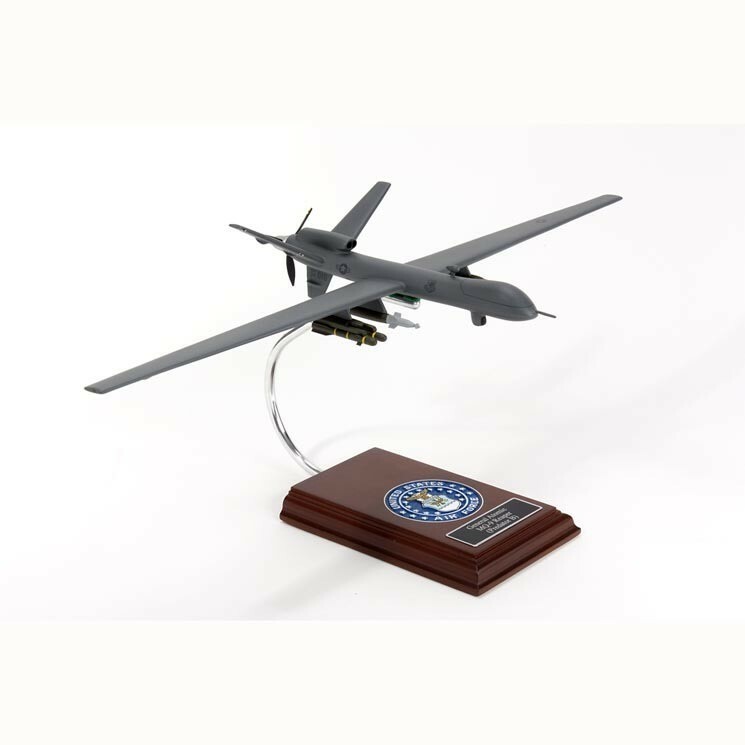 If you want to honor the excellence of this aerial vehicle, there’s no better way to do it than to get this museum-quality scale model aircraft. This is a faithful replication of the Reaper, so owning one is pretty much like having a piece of history with you. It’s crafted, painted, finished, and perfected according to scale drawings—no details are spared in making this aircraft replica. With its exquisite finish and three-dimensional effects, this desktop model aircraft is ready to leave onlookers awestruck.